This lovely product will always be one of the top sipping rums of my 2012 experience. The awards it has garnered since 2007 state boldly that many others think so too. Stirred by the Rum Howler’s listing of the Plantation Barbados XO in his intriguing top 30 rum list, and having brought back a bottle from the amazing Rum Depot store in Berlin back in August (yes, it was gathering dust for several months, them’s the breaks when you have a day job and a family and other interests), I resolved to check it out after finishing off the St Lucia series. It was run up against three enormously different rums which could not possibly be mistaken for each other: the Renegade Cuba 1998, Downslope Distillery’s wonky 6-month wine-barrel aged rum from Colorado about which I can’t say enough bad things, and the amazing 2012 Rum Nation Demerara 1989-2012 23 year old about which I can’t say enough good things. 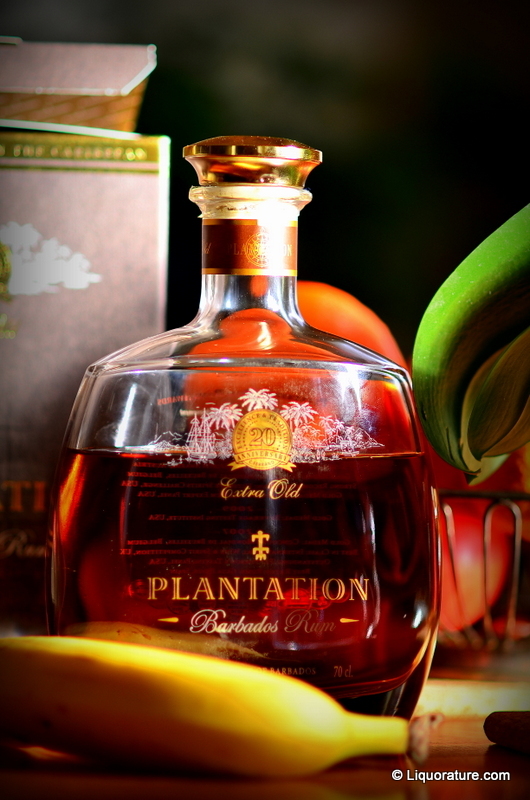 The Plantation series of aged rums from Cognac-Ferrand are the major remaining hole in my review lineup (as of the beginning of 2013) of widely available commercial rums, if you don’t count other rather more exclusive European boutique makers like Bruichladdich, Cadenhead, Berry & Rudd, Bristol Spirits or Fassbind (among others) which rarely touch the Great White North. Knowing what I know now regarding how to begin a review site of popular spirits, I really should start with the younger Plantation variations and move up the scale, but when you have twenty to chose from and can only pick one, you might also do as I did, and start at the top…assuming your wallet holds out. And I’m glad I did. Barbados rums tend to be on the soft side, but this one was like a feather pillow for the nose, truly…it handily eclipsed the Mount Gay 1703 with scents of white chocolate, buttery toffee, the nutmeg of a good eggnog, vanilla and caramel, and a lovely background of ground coconut shavings in a melange that was utterly terrific. It was a rich sensory love-in of a nose, solidly constructed, soft and breezy and if you ever wanted to have a Christmas rum to sip by a roaring fire, you would never have to go further than this one. I thought of it like a liquid, warm Hagen-Dasz, with all the sweetness that implies. The palate was similarly excellent: sweet and a shade briny (not too much), soft as a mother’s hug before school on a cold day. It had hints of bananas and orange peel on the medium-heavy body, salty caramel, white chocolate vanilla. My lord this was good, rich and pungent and smooth as a cat’s tummy fur, with just a shade of heat to lend character, a touch of oaky spice and burnt coconut…if this rum was equated to a painting, it would be a lush impressionist Monet or Degas, colourful, vibrant and above all, real. And for once the finish completed the overall picture without failing, warm, medium long and rich, with traces of almonds, citrus and oak on the slightly astringent close. The XO is a rum that is a blend of Plantations’s “oldest reserves” (not sure how old these reserves were, since no further details are available). The blends are first aged in Barbados in ex-bourbon casks, then taken to France where they undergo secondary ageing in smaller French Oak casks for a further year to eighteen months. I must concede that this process of double ageing (somewhat akin to the Dos Maderas 5+3 or 5+5) is much to my taste…it provides the resultant spirit with a depth and creaminess that is quite becoming and is absolutely meant for leisurely exploration when time is not a factor and a buzz is not on the menu. As I noted above, this is a solidly built, well presented, utterly traditional all-round excellent premium rum. At €45 I think it might be one of the better value for money rums available for a 40% product. That sentence should be parsed carefully, because what this means is that it is superlative at genuflecting to all the expected traditional rum expectations…but without rising above or vaulting beyond (or violating) them…it lacks the passive agressive adventurousness of Fabio Rossi’s Rum Nation Demerara 1989 23 year old (45%) or the stunning-if-somewhat-oversweet Millonario XO (40%). This is not to diss the Plantation product, mind you, just to give you a sense of both its quality and what else it could have been had someone taped a pair of balles to it. I wish I could tell you which rums in the Plantation lineup this one compares well to, but I can’t (Plantation Rums are not widely available in Canada). Suffice to say, the Anniversary XO is phenomenal taken merely by itself. It has a complex softness and style recalling the St. Nicholas Abbey 10 or 12 year old, or most of the top Panamanian rums, and a finish that is close to conjugal harmonies. If it has a weakness at all, it’s in hewing too closely to the profile of rums, and not daring to step a little outside the demarcations: I think that had it done so, beefed itself up, perhaps aged it a little differently, they may have been one of the top premiums in the world which all others had to beat. As it is, it’s a great sipping rum that any aficionado should have on his shelf, and share generously with people who simply don’t get how good a premium rum can be when made by people who are fully invested – and who care about – the resultant ambrosias they create. This is sipping Rum, I would go into a panic mode if this was not in my bar. I only wish these Rum distilleries would release these in a 45% or even better 50%+ ABV. They could start to over haul the Bourbon craze instead of wasting away on the shelves of liquor stores. I mean, your highest scores belong to unattainable cask strength Rums that are Unicorns. May as well be Pappy Van Winkle. If I ever meet Alexander Gabriel in one of the European rumfests, I’ll make it a point to tell him. I agree many of his rums could be stronger. The issue of great cask strength rums not being available in North America is one many have commented on in the past, and has a lot to do with insane Governmental regulations, licensing, taxation and distribution laws in the US and Canada. Review is right on. World class stuff. Your review of the 5 year is also on the money. To make money, the Plantation folks have lowered their standards and are now rushing product to the market. To me, you are also one of the few that has picked up on the value of the Cruzan rum. As a general note, I am not sure that most people understand what air does to rum. In other words, if a rum has had to much exposure to air, it may not resemble the original tasting.